A father and his 13-year-old daughter were remembered at a vigil in the Bronx on Sunday night. The two were killed in an apartment fire earlier in the day. The FDNY said it was sparked by an electrical plate. Wale Aliyu reports. A man and his 13-year-old daughter were killed in an apartment fire in the Bronx on Sunday, police said. The fire broke out shortly after noon in a building on Dewey Avenue in the Throgs Neck neighborhood, the NYPD said. Firefighters battled the blaze for about an hour before getting it under control. Two firefighters suffered minor injuries, the FDNY said. The victims, 62-year-old Nelson Rojas and his daughter Yolanda Rojas, were found unresponsive in the apartment by firefighters. They were taken to Jacobi Hospital, where they were pronounced dead. Aurora Ronda, who volunteers on the school board at Mott Hall Community School, said she called the principal to make sure counselors were in place for the girl’s classmates when they returned to class Tuesday. 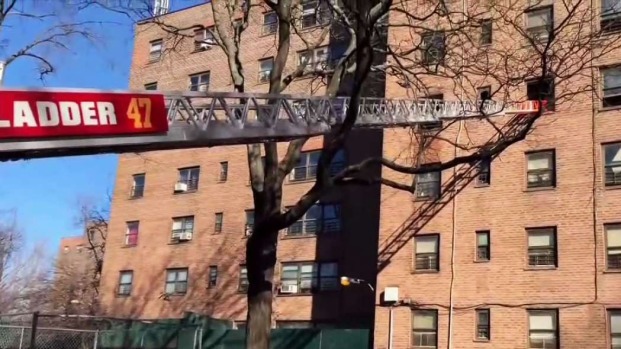 A man and his 13-year-old daughter were killed in a fire in the Bronx on Sunday. Wale Aliyu reports. “All the kids already know about it, because it's been all over Facebook,” Ronda said. “Her dad used to always walk her to school because she used to get bullied and stuff. A few days ago she was getting bullied but I told them to stop, so I stuck up for her,” Rodriguez said. A vigil was held for the father and daughter outside the apartment building on Sunday night. When the girl's aunt showed up, she was brought to tears by the show of support from residents. Speaking in Spanish, Yolanda's aunt said she doesn't know how to tell Nelson's other children, who live in the Dominican Republic, about what happened. Antonia Hernandez, 11, was among those fighting back tears at the vigil Sunday night. She said she and Yolanda would eat lunch together and had the same sneakers. "Sometimes we'd wear them together, and it's like really heartbreaking." "I just keep on looking up and -- you know, God is with her -- and it's like a little bit emotional," Hernandez said. Alma Echevarria was at the vigil too. She said the father and daughter were always together and "now they will rest in peace together." "You don't see dads like that," Echevarria said. "You see dads come and go. No, this man stood there since the day she was born." The FDNY says the fire was accidental and was sparked by an electric plate in close proximity to bedding. Many residents were complaining about a lack of heat in the building. NYCHA told News 4 it scheduled a heat and hot water outage Tuesday because of a water main break that happened the previous weekend. The authority said the heat and hot water were turned back on that same day. It said it hadn't received any complaints as of Sunday. It's not known if a possible lack of heat was connected to the electrical plate or the fire.